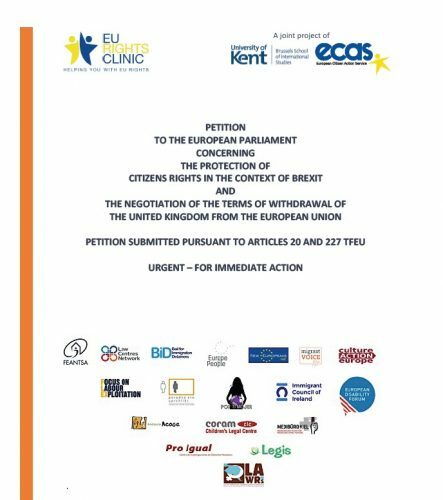 This week, the EU Rights Clinic, the European Citizen Action Service (ECAS) and 80 signatories including PICUM members submitted a petition to the European Parliament. The petition calls for immediate action, to address specific gaps in the Brexit draft Withdrawal Agreement, concerning the protection of some categories of citizens’ rights after the Brexit date. PICUM’s input to the petition urging that the UK must recognise children as individual rights holders was included in the petition. 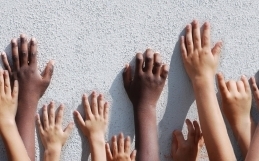 The UK must uphold the commitments to the UN Convention on the Rights of the Child (UNCRC) found in the Charter of Fundamental Rights and at EU policy-level. 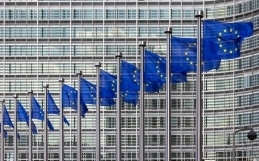 Given the lack of progress in handling citizens rights’ protection, as requested in a letter to EU Council President Donald Tusk sent earlier in the year, the EU Rights Clinic has now submitted the petition seeking further to address specific gaps and omissions in the draft Withdrawal Agreement. The Petition has requested a hearing as a matter of urgency and has asked for the European Parliament to issue a short motion for a Parliamentary resolution calling on the Council and the Commission to remedy ensure the gaps and omissions in the draft Withdrawal Agreement. The draft Withdrawal Agreement still fails to address the rights of those family members of both UK and EU citizens who have returned to their home country after having resided in another EU Member State (Surinder Singh family members), during the transitional period. Moreover, so-called Zambrano carers (non-EU parents of EU children living in their own country) are also excluded from the list of citizens eligible for the UK’s proposed new EU settlement scheme. Although the UK Home Office assured the EU Rights Clinic that family members falling into these categories would be covered by the “settled status”, the Statement of Intent released on 21 June 2018 regrettably does not address their situation in a satisfactory manner. It is also essential for the Withdrawal Agreement to reflect the commitments made by the UK government regarding residence rights. 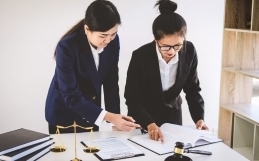 While the UK government has made commitments on the matter – such as waiving the requirement for holding comprehensive sickness insurance – these need to be the subject of formal binding provisions in the draft Withdrawal Agreement. The absence of such commitments from the draft Withdrawal Agreement is a likely source of anxiety and distress for EU citizens in the UK due to the uncertainty surrounding their binding effect on the UK government. Their inclusion in the Withdrawal Agreement would go a significant way to allay the fears of EU citizens and their family members in connection with their right to remain in the UK after Brexit. Please find the Executive Summary of the submitted Petition here. The EU Rights Clinic is a partnership between ECAS and the University of Kent in Brussels. It helps EU citizens and their family members overcome problems they encounter when moving within the EU.